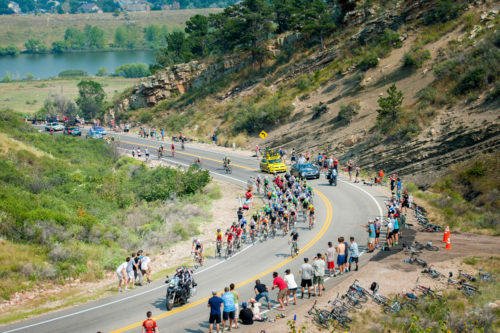 It’s probably safe to assume that most of the readers of Cycling West – Cycling Utah have watched a pro cycling race at one time or another; either the Tour de France on TV or a stage of our own Tour of Utah. We’ve all seen the riders suffering on the climbs or racing down twisty mountain descents risking life and limb. For every rider you see in action there are a number of unsung heroes working hard in the background to make it all possible. 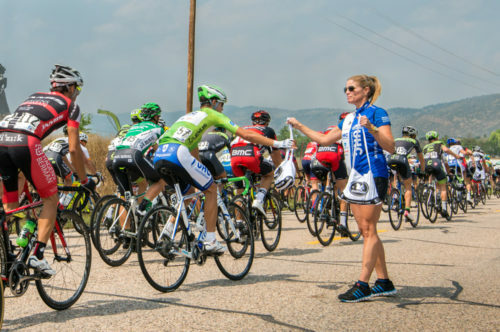 In late August 2015, I traveled to Colorado to photograph the USA Pro Challenge stage race. Fortunately, I was able to “sit in” with the United Healthcare Pro Cycling Men’s Team for an up close and personal view of a major UCI race. My story begins with the start of stage 4; a 126 mile long stage from Aspen to Breckenridge featuring high altitude climbs up over Independence Pass (12,095’) out of Aspen and Hoosier Pass (11,542’) before racing down to the finish in the ski town of Breckenridge. 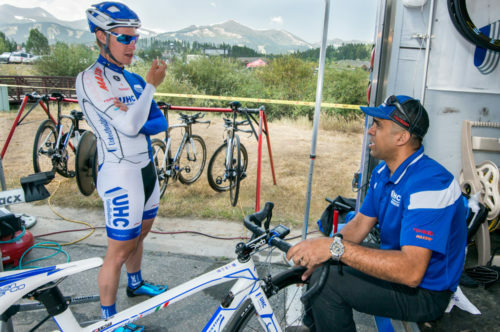 Before the start, I checked in with the UHC General Team Manager, Mike Tamayo, who would be driving the team car in which I would be riding. The soigneurs were busy loading the team cars and van with gels, lunch musettes and energy bars (Ally’s bars seem to be a team favorite). The mechanics loaded wheels and spare bikes onto the team cars. Once the prep was complete, we got in the car ready for the race to start. The team car order in the caravan is based on the rider GC, so with a UHC rider in currently 2nd place, were the #2 car in the lineup. The race began and we quickly pulled out into the caravan for a neutral “parade lap” through Aspen before heading up the climb to Independence Pass. Right from the start, the pace was furious and the peloton stretched out like a thin rubber band. I was impressed by how organized Mike and the UHC staff were. Inside the car we had the rider start grid taped to the dash with the critical riders highlighted with color coded felt tips noting which riders were in contention for overall GC, sprint jersey, KOM, etc. As the race developed and riders attacked or were dropped, Mike would mark off the ones who potentially could affect UHC’s placing for the day. The updating of the grid sheet along with radio conversations with Hendrik Redant, the other team director driving the 2nd UHC car gave us a real time “sitrep” of what was happening out on the road. Even the gels we handed out were organized with one door pocket for non-caffeinated and the opposite door for caffeinated. Like I said – very organized. Meanwhile back at the race, we had just made it down one hairy, nail biter of a descent from Independence Pass. As the road flattened out, I got a chance to observe Mike at work. A consummate professional, he was constantly discussing strategy with Jorge Romero, our mechanic in the back seat, and over the radio with Hendrik. The discussion flowed with constant checks on where our riders were, the gap between our team cars, who was in the break, etc. etc. Also, Jorge gave Mike a constant update of the location of any riders freelancing off our rear bumper which kept everyone safe on the road. The UHC staff handled all of this seamlessly. Even the occasional conversation with another team manager as their car pulled alongside ours added to reading the race as it unfolded. Mike said the goals for the day were to retain the sprinter’s jersey (Kiel Reinjen) and if possible a stage win. As we pulled up along our riders, he told them “steady, save legs” or “hold for now, full gas later” Hendrik radioed up asking what’s going on. Mike replied “there’s a bike race, lots of riders in lycra pedaling fast”. Humor in the team car. A couple of UHC riders kept dropping back to pick up water bottles, gels and bars. They would stuff their jerseys full of bottles and pockets full of gels, then Mike would give them some instructions and off they’d go to the front to deliver the goods to the other UHC boys. It was a continual revolving loop throughout the race. The following day, I had a chance to speak to Tanner Putt about his life as a racer for UHC. Tanner grew up in Park City, Utah and started out as a X-C ski racer before transitioning to road cycling. 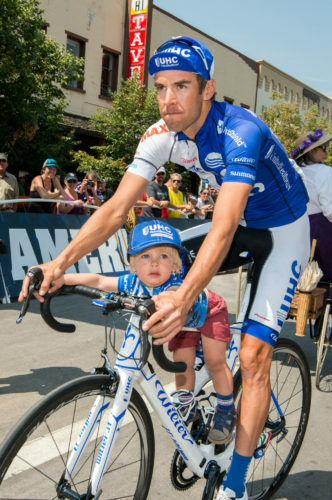 After racing for Hincapie, Bontrager and Bissell teams, this is his 1st year with UHC. On a typical race day, Tanner tells me that he gets up about 4 hours before the race start, has coffee and relaxes in the hotel. He eats breakfast about 3 hours before the race, then kicks back until it’s time for rider sign-in. Not much warm-up unless the course has a hard start. Immediately after the race, he tries to get as much food and recovery drink in as possible, then heads to the hotel. Next is massage and shower, eat dinner and go to sleep ready for the next day. We arrive at the feed zone after the riders have rolled through. We stop briefly at the team van so the soigneurs can restock our car since we’ve run out of Ally’s bars and some gels. Curious about the soigneurs’ duties, later on I caught up with Niki Detrick, UHC team soigneur. I asked Niki what does a soigneur do? She replied “a soigneur does everything to take care of the riders physically. Mechanics take care of the bikes, we take care of the riders. We take care of their health, whether it be first aid or them being sick to massage and recovery. I am a chiropractor as well.” The soigneurs do all of the race prep from filling bottles (about 150-250 per day) and preparing food to loading up the team cars and van. In addition to doing all of the laundry, they move the riders in and out of the hotels. Niki said “it’s kinda like being the mom”. Back on the road, there’s a touch of wheels and UHC rider Danny Summerhill goes down. We get the call from race radio and rush ahead to assist. Jorge is out of the car in a flash. Danny is unhurt, his bike is ok, so with a solid push from Jorge, he’s pedaling hard to get back to the group. Later on, I spoke with Jorge about his job and he had this to say “typically the mechanics are the first ones up and last ones down”. They arrive early at the start to check the bikes, tire pressures and make adjustments if needed. Then they load the spare bikes and wheels onto the team cars. Jorge said anything can happen during the race so they try to be as prepared as possible. After the race, the bikes are all loaded up and the mechanics drive the bus to hotel, which may be an hour or more away depending on the next day’s stage. Jorge stated, “That’s when the heavy workload starts. We wash all of the bikes and inspect them for any damage, make sure they’re all functioning correctly, go over all the torques on the bolts.” The bikes are loaded back in the team cars or bus ready for the next day’s stage. Back to the race. Mike’s final advice to riders on the climb up Hoosier Pass is to hold off until the final short climb up Moonstone Road, then “full gas” to launch Kiel for the stage win. Unfortunately, by the time we hit the top of the Hoosier climb, the UHC boys were tired from the climbing and the brutal crosswinds we experienced coming into the town of Fairplay. At this point, the strategy changes, hold steady, stay safe and live to fight another day. As we arrive in Breckenridge our car gets directed into the caravan deviation to allow the riders go past to the finish line. The race is over. Rohan Dennis and Brent Bookwalter of BMC take first and second. Clarke from UHC finishes just off the podium in fourth. Kiel Reijnen loses the sprinter’s jersey to Dennis today, but eventually gets it back to win the race overall sprinter’s jersey. 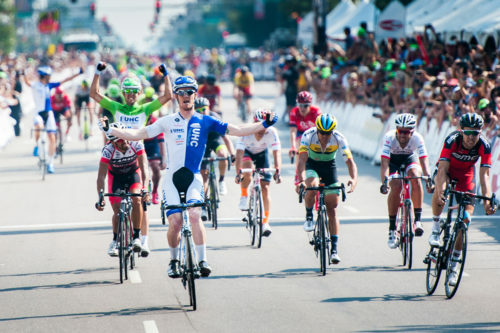 On a side note, John Murphy of UHC won the final stage 7 in Denver, a dramatic finish for the UHC team. The staff gets to work. Mechanics wash and inspect all of the bikes. Setups are checked, suspect parts replaced. The soigneurs do the team laundry and prep for the next day sandwiched in between giving the riders their massages. The riders get their massages, eat dinner then go to sleep. Thus the cycle begins, ready for another day of racing in the high mountains of Colorado. It could be anywhere in the world, the routine remains the same – life on a pro cycling team.